Welcome to our wedding venue!! We are so glad you stop by and we are excited about your big day. 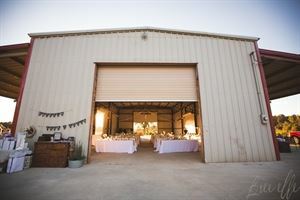 Maison de L'Arpenteur Wedding Venue is located in Kirbyville, TX. Sitting on 300 plus acres overlooking fields of hay is a rustic barn for the perfect wedding atmosphere. Included in the package: 1-3 day access for your rehearsal, rehearsal dinner, wedding, and/or reception Access to apartment for bridal party to get dressed Access to Barn, Stable, and surrounding areas for your big day 24 Round tables, 4 rectangular tables, 4 tall wooden tables, 2 long rolling bars, 240 chairs Commercial sink Sound system Some ice proved with ice machine access Brand new handicap accessible bathrooms right by barn Additional day access for wedding or engagement pictures (additional must be cleared by owners) Check us out at www.larpfarm.com for more information and pictures or you can contact us directly at *NOT DISPLAYED* We would love for you to book at tour and come check us out today! !